Welcome to J.M. Hayes Cattle! We are 3rd and 4th generation cattle producers that make a living with cattle. At J.M. Hayes Cattle, ranching is what we do; Ranching is our way of life. Located just north of the red river in southeast Oklahoma, this is an area that is well suited for cattle production. We strive to produce cattle that work for our customers. 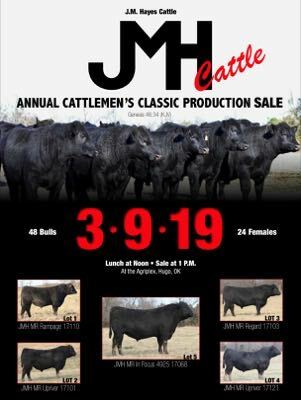 We sell bulls to people in numerous states and environments; from Alabama, Tennessee and other parts of the southeast to the fescue pastures of Missouri and north Arkansas, all the way to dryer areas in the panhandle of Oklahoma and Texas and into New Mexico. We know our cattle because we are around our cattle, all day every day. We can tell you about the dam and granddam and most times the great granddam of any of the cattle on our ranch, and we take pride in that. Knowing this information the way we do, and knowing how it translates to you means we have to do a couple of things differently. 1. Very rarely will we buy a female. This allows us to really know what the tendencies are from our females, whether it's the fact that she milks harder than her EPD suggest, or if she needs to be bred to a certain type bull, or other things, we usually know this from experience. 2. We are not scared to use our own bulls. We truly believe that we produce as good of bulls as you can find anywhere, and if we won't use them why should you? We do A.I. a lot of our cows, but there are some cows that we breed straight to our own bulls because we haven't found an A.I. bull that can consistently produce the results that we can get from one of our own bulls. We believe the reason our bulls adapt so well to different environments is because we don't treat our cattle like some registered breeders do. We hear people say they make their cattle work, and then during the winter they feed 35 pounds of silage and 5 pounds of ddg per head per day to their cattle. Not here. While there is nothing wrong with feeding cattle like that, we simply can't justify that much input expense. Our cows will be fed between 3 and 6 pounds per head of a feed we have mixed (and that feed will change depending on commodity prices) until there is enough grass to sustain them, then with the exception of lick tubs in late summer there is no supplementation. Our bulls are the same way. After weaning our developing bulls will only get between 1% and 1.7% of their body weight in a feed we have mixed depending on conditions, weather etc. (Like the cow feed this feed will change depending on commodity prices). We get asked the question about "high roughage rations" a lot, and we do keep plenty of fiber in our feed, but keep in mind 220 bushel corn that was cut for silage is a high roughage ration but is also an extremely powerful feed. While most of our bulls have the genetic potential to have those massive 1400-1500 pound yearling weights, it is not sustainable for us to have that input expense, and it doesn't help our customers if their bulls fall apart or have soundness issues because they were over fed. Thank you for visiting our web page and please contact us with any questions about our cattle, or our operation.